In this groundbreaking book, journalist and innovation expert Warren Berger shows that one of the most powerful forces for igniting change in business and in our daily lives is a simple, under-appreciated tool--one that has been available to us since childhood. Questioning--deeply, imaginatively, "beautifully"--can help us identify and solve problems, come up with game-changing ideas, and pursue fresh opportunities. So why are we often reluctant to ask "Why?" Berger's surprising findings reveal that even though children start out asking hundreds of questions a day, questioning "falls off a cliff" as kids enter school. In an education and business culture devised to reward rote answers over challenging inquiry, questioning isn't encouraged--and, in fact, is sometimes barely tolerated. 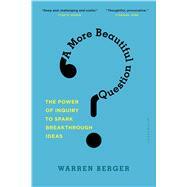 And yet, as Berger shows, the most creative, successful people tend to be expert questioners. They've mastered the art of inquiry, raising questions no one else is asking--and finding powerful answers. The author takes us inside red-hot businesses like Google, Netflix, IDEO, and Airbnb to show how questioning is baked into their organizational DNA. He also shares inspiring stories of artists, teachers, entrepreneurs, basement tinkerers, and social activists who changed their lives and the world around them--by starting with a "beautiful question." Warren Berger has studied hundreds of the world's leading innovators, entrepreneurs, and creative thinkers to learn how they ask questions, generate original ideas, and solve problems. His writing and research on questioning and innovation has appeared in Fast Company, Harvard Business Review, and Wired. He is the author of the internationally acclaimed book Glimmer, an in-depth analysis of creative thinking that was named one of Business Week's "Best Innovation & Design Books of the Year." Berger has appeared on NBC's "Today Show," ABC "World News," CNN, and NPR's "All Things Considered." He lives with his wife Laura E. Kelly in Westchester, New York. www.AMoreBeautifulQuestion.com.